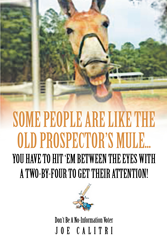 Recent release “Some People Are Like the Old Prospector's Mule” from Page Publishing author Joe Calitri is an enlightening piece which encourages readers to become informed voters. Conservative-minded folks will enjoy and appreciate the perspective, self-described moderates will avail themselves of valuable information, and leftists will learn why their ideology doesn’t work. Joe Calitri, a devoted writer and author, has completed his new book “Some People Are Like the Old Prospector's Mule”: a gripping and potent book of the views of the government today and its political leadership. How informed are Americans? A staunch Constitutional Conservative, Joe is a retired twenty year veteran Corrections Officer from the Massachusetts Correctional Institute at Norfolk; former MCIN Chief Union Steward and Field Representative for the Massachusetts Correction Officers Federated Union (MCOFU); Security Officer for the state of Florida; and Computer Assisted Data Specialist for Nielsen Media Research, The Nielsen company LLC. His writing credentials include editing the weekly Bullet and monthly Newsletter for the MCOFU, Chairman and Newsletter editor for the West Bridgewater, Massachusetts Republican Town Committee, and Secretary and Newsletter editor for the Charleston Park Homeowner’s Association in North Port, Florida. He has had numerous editorials published over the years in the Boston Herald, Brockton, Massachusetts Enterprise and North Port, Florida Sun newspapers, and is currently enjoying retirement, creative writing, and recording original music in St. Petersburg, Florida. Published by New York City-based Page Publishing, Joe Calitri’s thought-provoking tale is about readers being resilient enough to protect their rights and resist tyranny. America is calling, and citizens must band together and fight or lose the country to illegals, terrorists, and Liberals. All across the nation a quiet rage is building against the liberal assault upon American values. More so than ever in the history of America, the concerns and patience of its people are being tested, tried, and attacked by a group of elitists that is Hell-bent on the destruction of this country. Voters can make a difference by adequately researching political candidates before casting their ballots. Readers who wish to experience this enlightening work can purchase“Some People Are Like the Old Prospector's Mule” at bookstores everywhere, or online at the Apple iTunes store, Amazon, Google Play or Barnes and Noble.